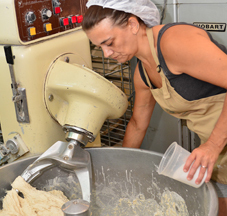 The Friendship Farm bakery is known around the Pittsburgh area for its unique varieties of rustic breads. Dense and hearty, with a chewy crust, they are the type of breads baked in farm kitchens in years gone by. The bread doughs are made with homemade starters or slow fermenting poolishes and given ample time to rise, imparting to each bread its special flavor and texture. Whole grains, many of which are sprouted to make them more nutritious, dried fruits, herbs and even vegetables are added to the doughs in delicious combinations. The bread is then baked on stone hearths in ovens imported from France. 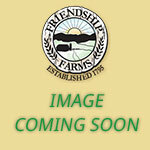 The loaves are available for sale at the farm, as well as in select supermarkets and restaurants. For convenience, they can be shipped directly to customers via our online store. Below is a description of the breads we make. Each has its own flavor, ingredients and, sometimes, history. The one thing they all have in common is that they were hand-crafted with care by our dedicated staff. 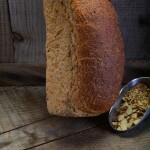 All Grain nut is muesli bread filled with several nutritious ingredients. It contains wheat, spelt, soy, oats, and flax grains. We also mix in almonds for crunch and wildflower honey for a little sweetness. 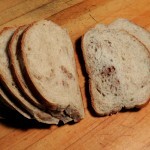 We originally intended it to be an “earthy” breakfast bread, but it makes great sandwiches too. Ingredients: Unbleached wheat flour, organic whole wheat flour, spring water, organic whole grain spelt flour, organic soy flour, wildflower honey, organic cracked oats, almonds, organic flax meal, sea salt, yeast. This is a hearty combination of an organic buckwheat flour starter, with sprouted barley and molasses. Buckwheat is becoming well known for its health benefits which include aiding in the prevention of cancer and heart disease. We use it for sandwiches and toast. It also makes a tasty French toast. Ingredients: Unbleached wheat flour, spring water, organic buckwheat flour, organic cracked barley, molasses, sea salt, yeast. 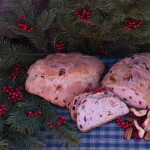 This is our traditional Christmas holiday bread. 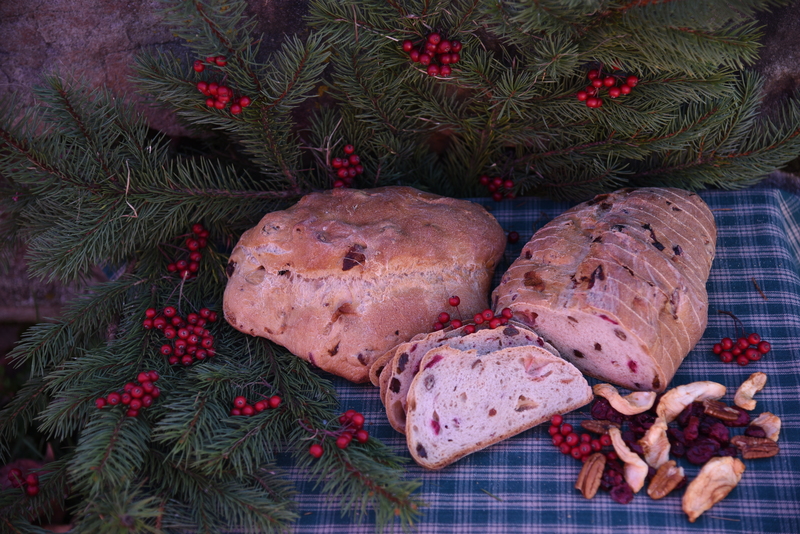 We start with a sweet dough with a hint of cinnamon, and fold in raisins, apples, cranberries, cherries and pecans. Ours is the real deal with all natural ingredients. When unsliced it is typically sold with a white icing, sprinkled with pecans. It makes a wonderful breakfast bread when toasted or eaten right out of the package. Friends and relatives will appreciate our Stoellen as a unique and delicious gift! Ingredients: Unbleached wheat flour, spring water, sugar, dark raisins, apples, cranberries, eggs, cherries, pecans, butter, salt, yeast, cinnamon. Straight from our grandmother’s recipe, this is a mildly sweet bread with just the right amount of cinnamon. 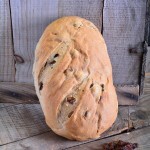 Each slice is loaded with plump dark raisins. 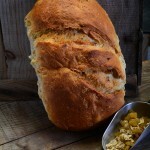 It is the ultimate traditional breakfast bread! Note: This bread is traditionally served with a drizzle of white confectioners icing. In its sliced form however, it is un-iced. Ingredients: Unbleached wheat flour, spring water, dark raisins, brown sugar, butter, yeast, sugar, cinnamon. Our delicious cinnamon bread described above without the raisins. 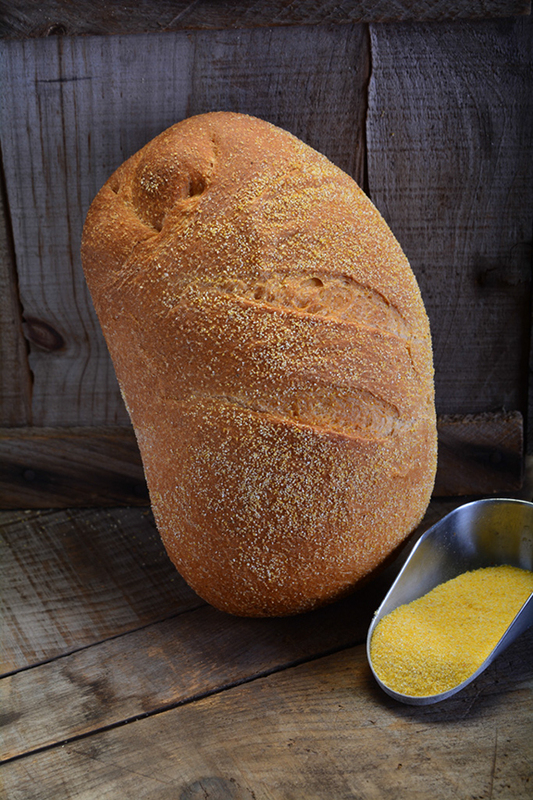 Our country corn bread is a soft-textured mild bread with the delicious taste of buttered sweet corn. 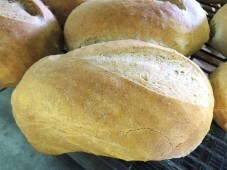 Unlike many corn breads prepared with a batter, this yeast bread is wonderfully moist and may be used in sandwiches or as dinner rolls or dinner bread. Ingredients: Unbleached wheat flour, spring water, cornmeal, sugar, butter, eggs, salt, yeast. This bread is an excellent all-round choice for most sandwiches or dinners. 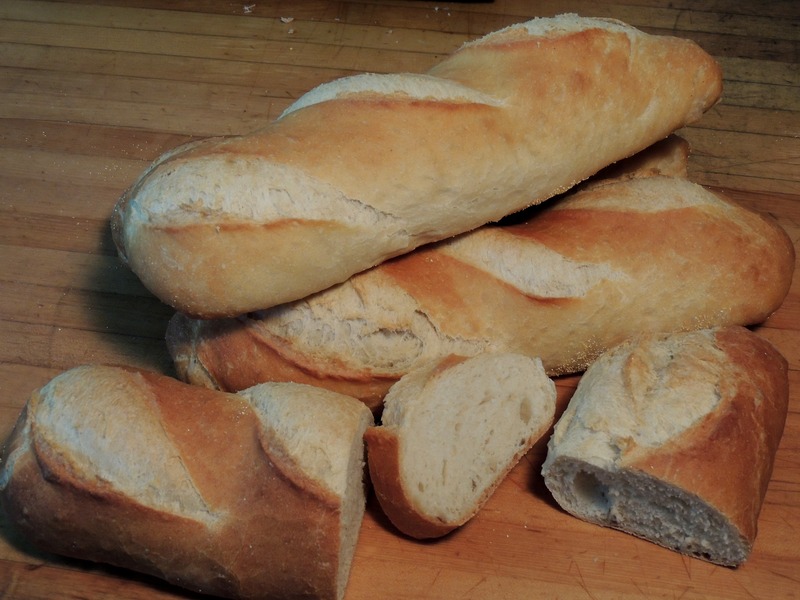 Our Country French loaf is slightly more dense than our other French loaves and is one of our most popular dinner breads. This bread contains no added fat or sugar! Ingredients: Unbleached wheat flour, spring water, yeast, salt. As its name indicates, this healthful bread is made with a delicious oatmeal and honey mixture with a hint of butter. We mix in organic cracked oats for additional nutrition and crunch. Ingredients: Unbleached wheat flour, spring water, rolled oats, organic cracked whole grain oats, wildflower honey, butter, salt, yeast. 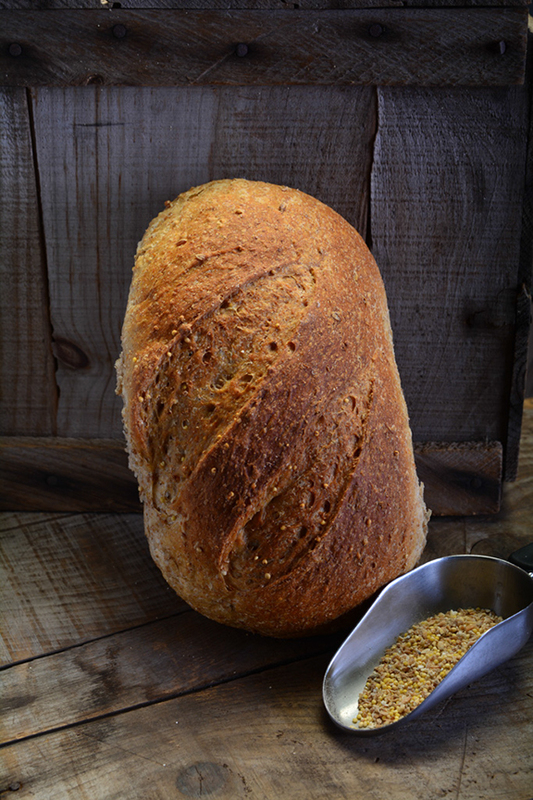 Cracked wheat is one of our popular whole grain breads that was taken straight from our mother’s kitchen. 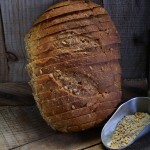 Its a rustic bread made with an organic rye starter and sprouted wheat. Molasses adds a hearty mild sweetness to the complete the flavor. 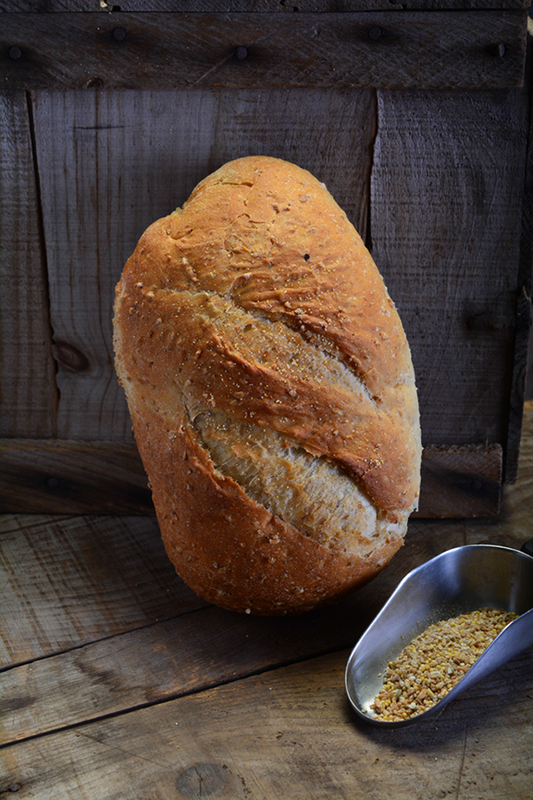 Use this delicious bread for sandwiches or as a compliment to any meal…especially soups or stews. 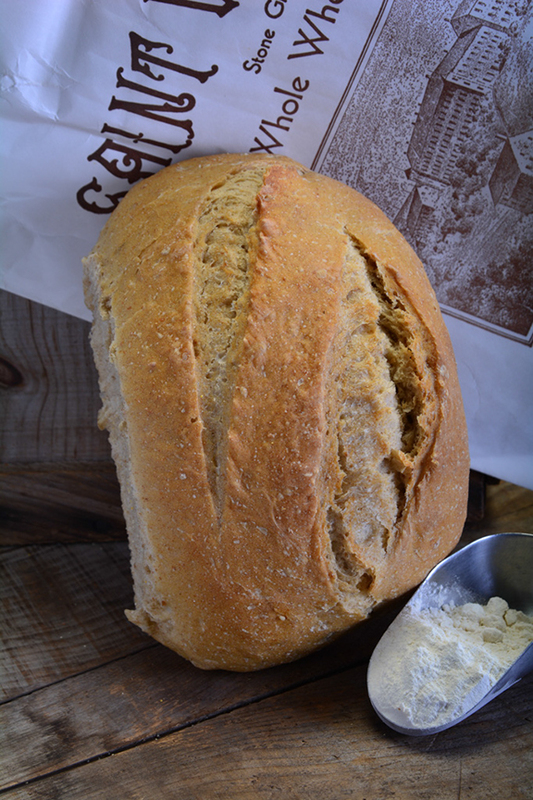 Ingredients: Unbleached wheat flour, spring water, sprouted wheat, organic rye flour, butter, molasses, yeast, salt. This is basically French bread with a little crunch. 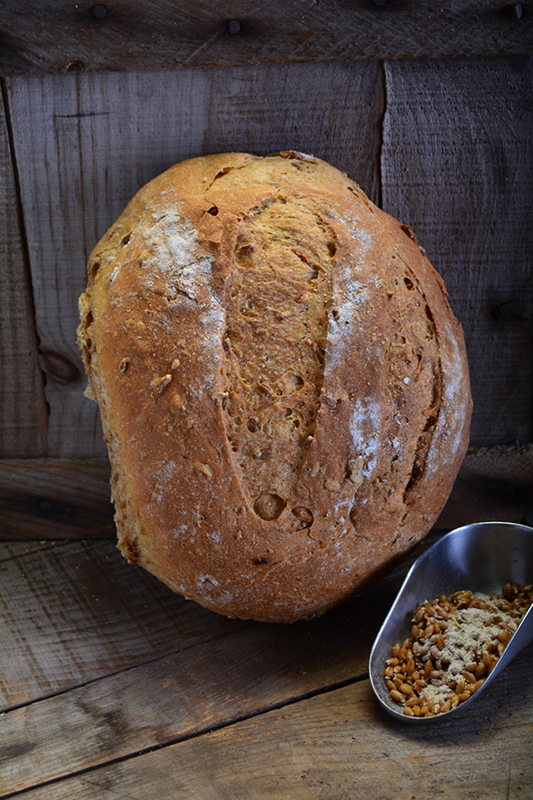 We mix our famous French bread dough with five organic cracked grains (barley, corn, oats, rye and wheat) to give this bread its delicious fermented grain taste and crunchy texture. This bread contains no added fat or sugar! Ingredients: Unbleached wheat flour, spring water, organic grains, (corn, wheat, barley, rye, oats), salt, yeast. 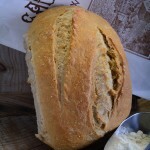 We use organic wheat flour to make the wheat starter used in this bread. 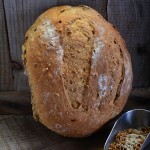 The wholesome tangy starter, combined with 5 organic cracked grains (barley, corn, oats, rye and sprouted wheat), give this bread its unique rustic flavor with a little sourdough bite. This bread contains no added fat or sugar! Ingredients: Unbleached wheat flour, spring water, organic whole wheat starter, organic grains (barley, corn, oats, rye, sprouted wheat), sea salt, yeast. 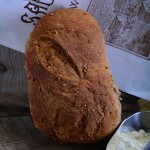 This bread is made with our organic rye flour starter. We add pure wildflower honey and organically grown freshly ground flax seed to give it its wholesome, nutty taste. Recent studies have shown that ground flax seed can have a positive influence on everything from cancer prevention to healthy cholesterol levels. 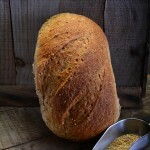 Ingredients: Unbleached wheat flour, spring water, organic rye flour, honey, ground organic flax seeds, sea salt, yeast. 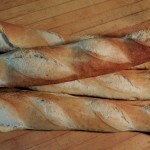 Like our Country French bread, our French breads are a delicious choice for sandwiches, dinners, breakfast toast etc. They have a chewy and crunchy crust and a delicious soft middle. 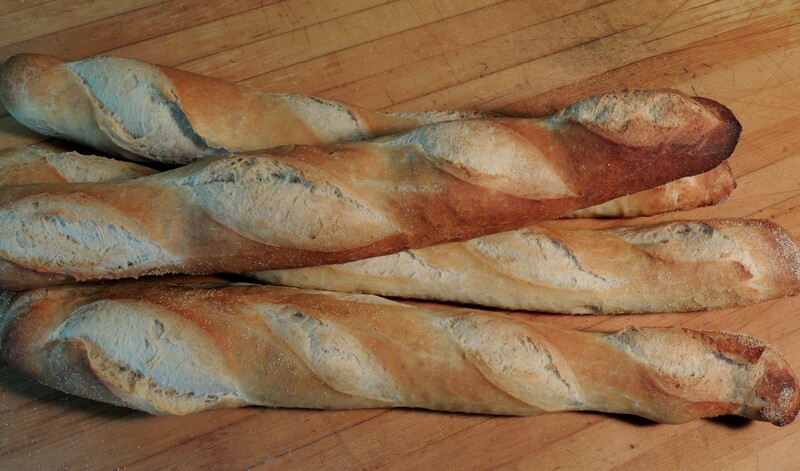 The texture of these breads is slightly lighter and more airy than our Country French and Italian Peasant breads. This bread contains no added fat or sugar! 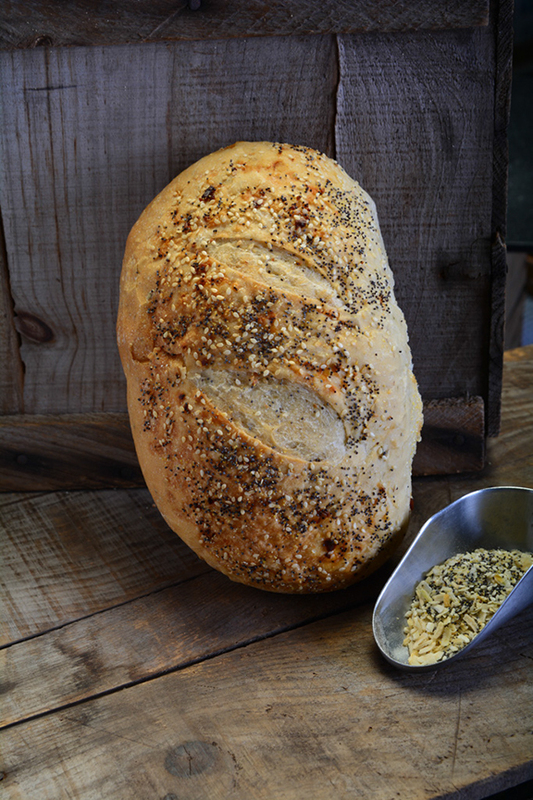 For herb lovers, our French Dill bread combines a chewy French bread crust with the fresh taste of dill weed. It is an excellent choice for light sandwiches and dinners. This bread contains no added fat or sugar! Ingredients: Unbleached wheat flour, spring water, yeast, salt, dill. Again, we take our French bread and add sun-dried tomatoes and basil. Tomato basil bread makes a delicious light sandwich or accompaniment to pastas or other dinners. This bread contains no added fat or sugar! Ingredients: Unbleached wheat flour, spring water, yeast, sundried tomatoes, basil, salt. 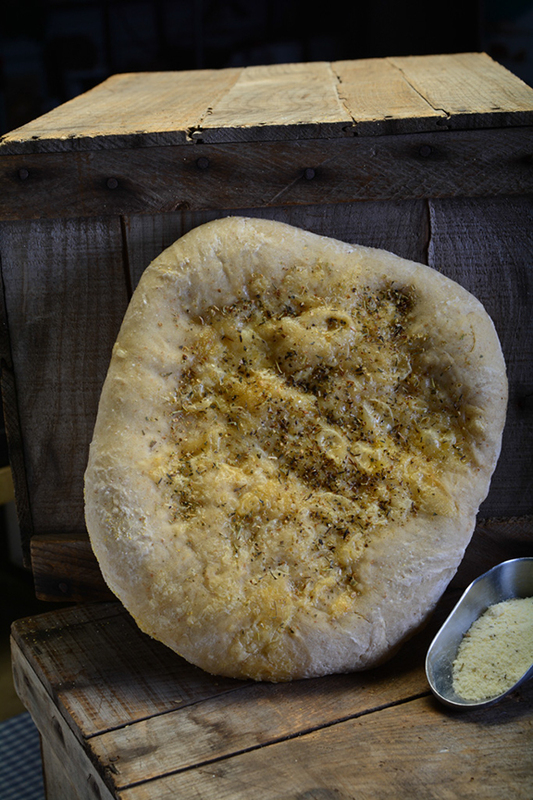 The Garden Herb and Seed is made from French dough mixed with the fresh taste of oregano, garlic, and onion. The loaves are then rolled in sesame and poppy seeds before baking to add additional flavor and crunch. Makes some of the best tasting sandwiches you’ll ever have! Ingredients: Unbleached wheat flour, spring water, sesame seeds, salt, poppy seeds, yeast, onions, garlic, cornmeal, oregano. 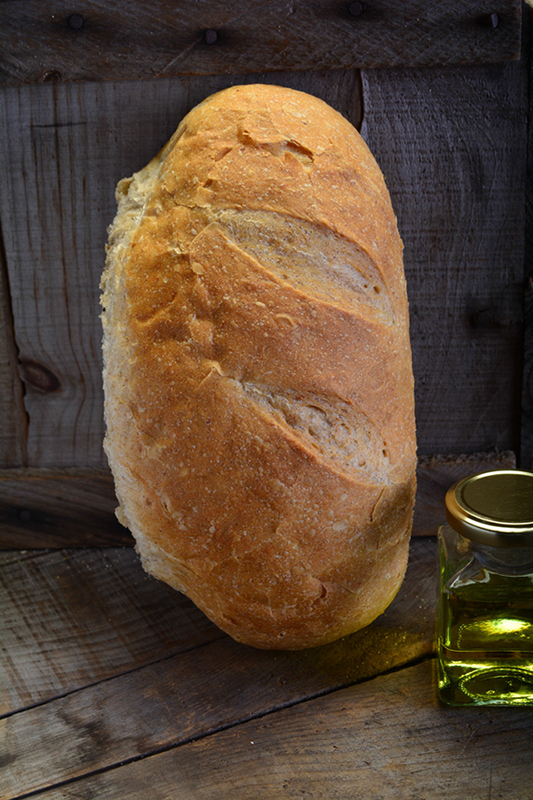 This flat bread is made with whole wheat flour, pure olive oil and garlic. It is topped with ground parmesan cheese and baked. Great for tasty sandwiches, pizzas or just snacking! Ingredients: Unbleached wheat flour, stone ground whole wheat flour, spring water, olive oil, parmesan cheese, yeast, salt, garlic, parsley. 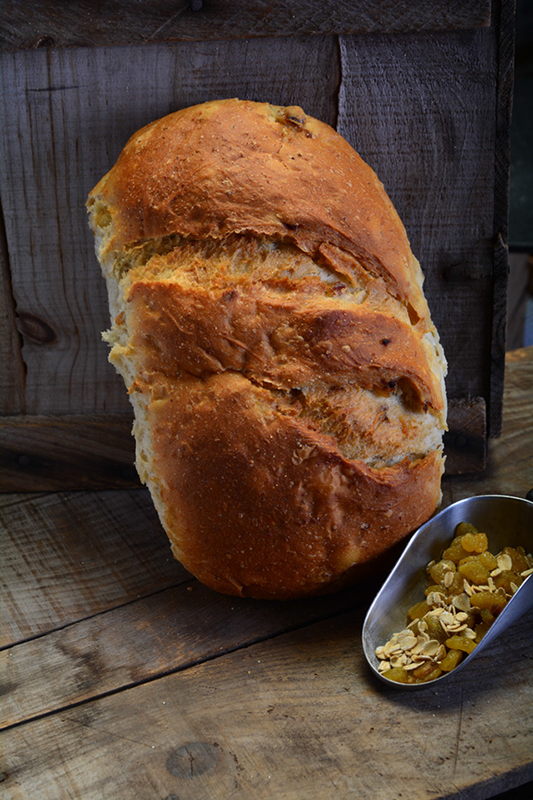 This hearty breakfast bread is made with oatmeal, sweetened with pure wildflower honey and loaded with delicious golden raisins. A slice or two of this bread will keep you energized all day! 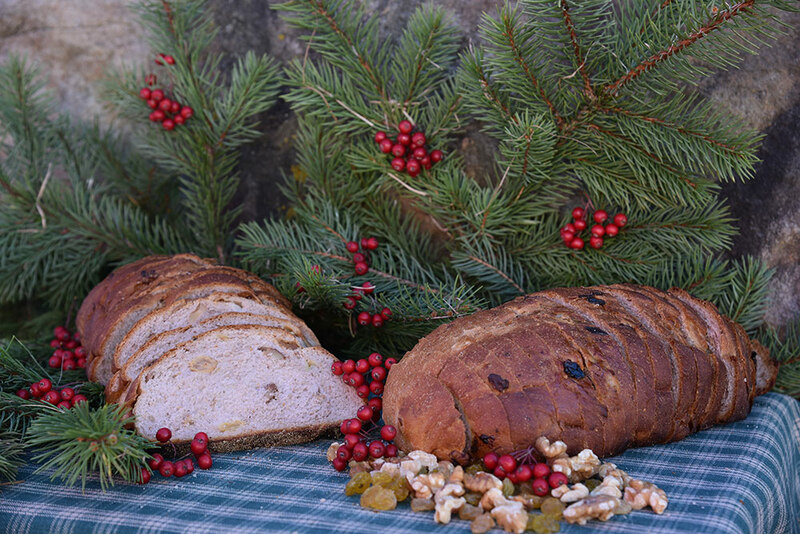 Ingredients: Unbleached wheat flour, spring water, rolled oats, golden raisins, wildflower honey, butter, yeast, salt. This flavorful focaccia is made with pure olive oil, sun-dried tomatoes, basil and garlic, and is topped with parmesan cheese and parsley. Focaccia can be used in many ways, from sandwiches and pizza crust to hors d’oeuvres. Ingredients: Unbleached wheat flour, spring water, sundried tomatoes, green peppers, olive oil, salt, spices, parmesan cheese. 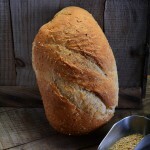 Italian Peasant bread is rustic bread made with organic whole wheat flour and pure olive oil. Makes great sandwiches or is a wonderful accompaniment for meals. 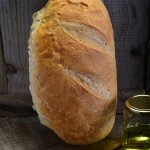 Ingredients: Unbleached wheat flour, spring water, whole wheat flour, olive oil, salt, yeast. This traditional Easter bread is another favorite from our grandmother’s kitchen. It is prepared from mildly sweet dough loaded with figs, walnuts and golden raisins. 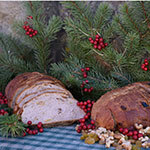 Kristapoma is a very popular holiday bread and is traditionally served toasted drizzled with honey. Ingredients: Unbleached wheat flour, spring water, golden raisins, figs, walnuts, sugar, butter, eggs, yeast, salt. 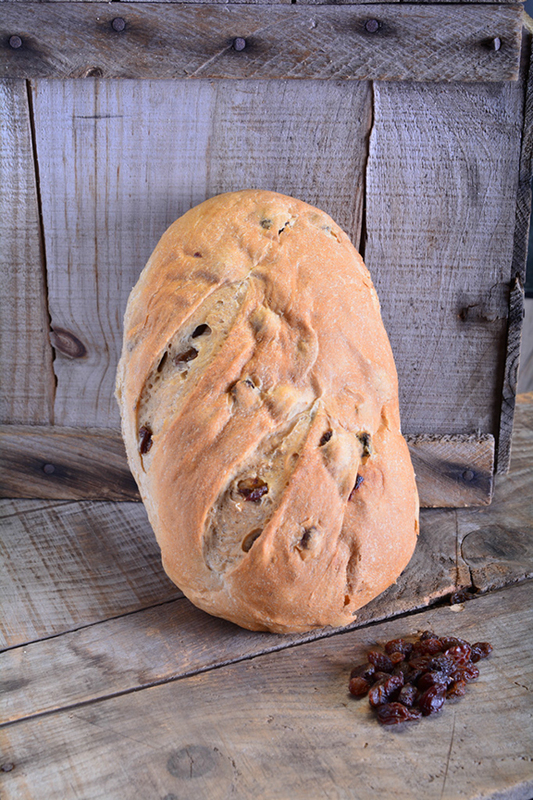 This classic bread is moist, delicious breakfast bread loaded with dark raisins, and apples and sweetened with locally produced maple syrup. When not sliced, it is covered with a creamy maple icing. Ingredients: Unbleached wheat flour, spring water, dark raisins, apples, pure maple syrup, butter, eggs, yeast, salt. This is our version of the famous St. Vincent Bread. 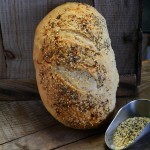 Based on the original recipe, we make this bread with flour that comes from locally grown soft wheat milled at the historic Gristmill at St. Vincent Archabbey, in Latrobe, PA. Like the bread baked at the Monastery years ago, this bread tends to have a hard crust, coarse texture and a nutty, earthy flavor. 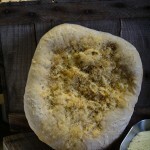 Monastery bread is best toasted and served with honey or jam. This bread contains no added fat or sugar! Ingredients: Unbleached wheat flour (stone ground at St. Vincent’s Gristmill), unbleached wheat flour, spring water, yeast, salt. Our Rustic Rye bread is made with whole wheat flour, a dark rye starter made with organic rye flour, organic cracked rye grain and molasses. 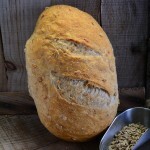 This hearty bread makes excellent sandwiches or works well with soups or stews. Ingredients: Unbleached wheat flour, spring water, stone ground whole wheat flour, organic rye flour, organic cracked rye grain, molasses, salt, yeast. 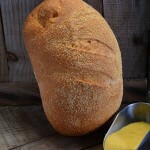 This is another delicious hearty bread made with the original recipe from our friends at St Vincent Archabbey. 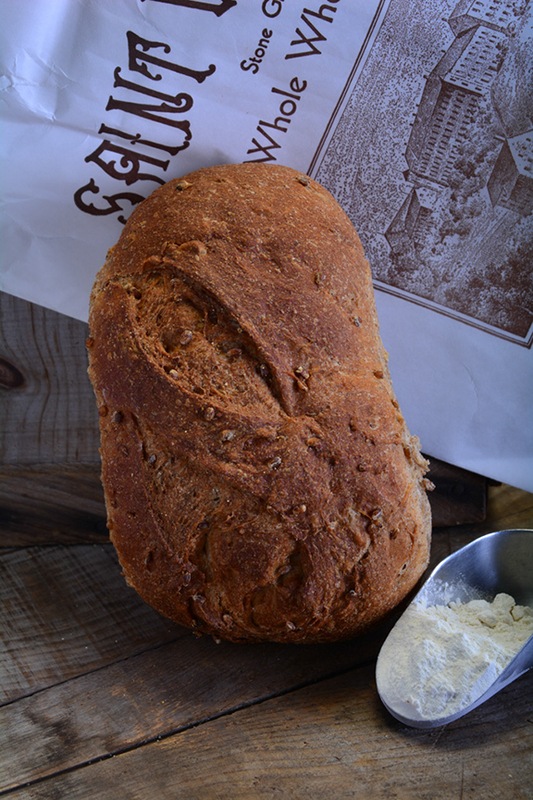 We use whole wheat flour milled at the Gristmill at St Vincent Archabbey in Latrobe, PA, We also load it with cooked wheat berries harvested from locally grown wheat, and sweeten it with a touch of wildflower honey. 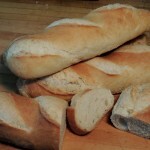 It is an excellent hearty bread for sandwiches, soups, stews etc. Ingredients: Unbleached whole wheat flour (stone ground at St. Vincent’s Gristmill), spring water, unbleached wheat flour, wheat berries, honey, salt, yeast. 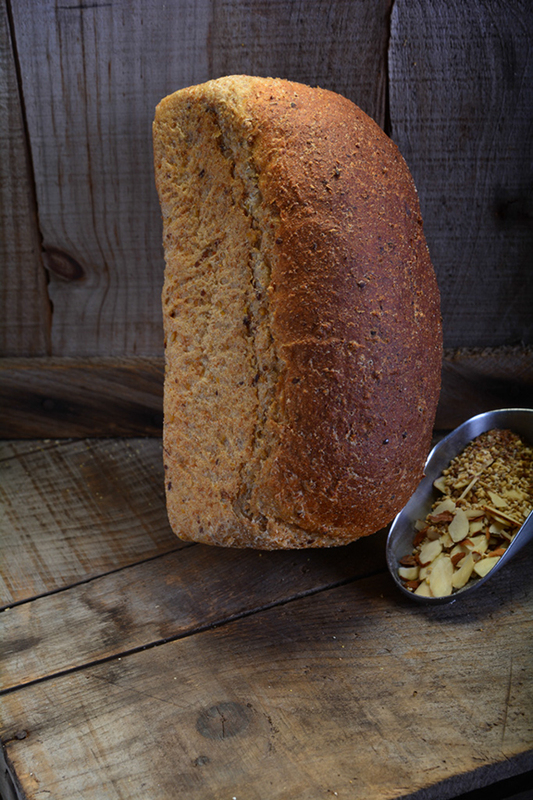 One of our most popular varieties, this crunchy organic bread is made with seven organic cracked grains (barley, corn, millet, oats, rye, spelt, and sprouted wheat) and organic whole wheat flour. It is sweetened with pure wildflower honey, which compliments the wholesome grain flavor. Seven Grain bread is excellent for sandwiches or toast, and goes well with soups and stews or anything else you can dream up! Ingredients: Unbleached wheat flour, spring water, organic whole wheat flour, organic cracked grains (millet, barley, corn, oats, rye, spelt, and sprouted wheat), wildflower honey, canola oil, yeast, sea salt. This true potato bread is made with a mellow starter, and whole cooked potatoes (including the healthy peel). Sourdough Potato is a delicious all purpose “white” bread with the comforting flavor of mashed potatoes and a very mild tang. Ingredients: Unbleached wheat flour, spring water, whole potatoes, butter, sugar, eggs, salt, yeast. 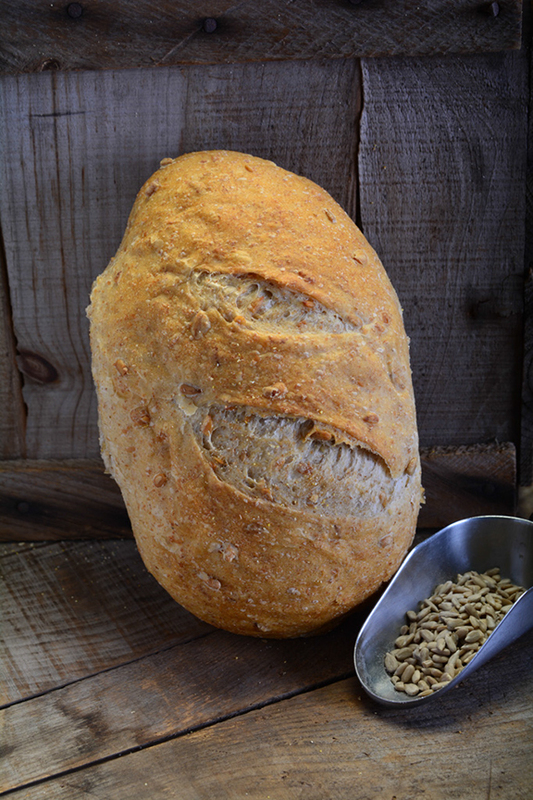 This is a hearty bread made with an organic whole wheat starter, and sprouted organic sunflower seeds. Sunflower bread makes nutty toast or sandwich bread. Its tangy nutty flavor goes well with soups and stews. Ingredients: Unbleached wheat flour, spring water, organic whole wheat flour, organic sprouted sunflower seeds, sea salt, yeast. 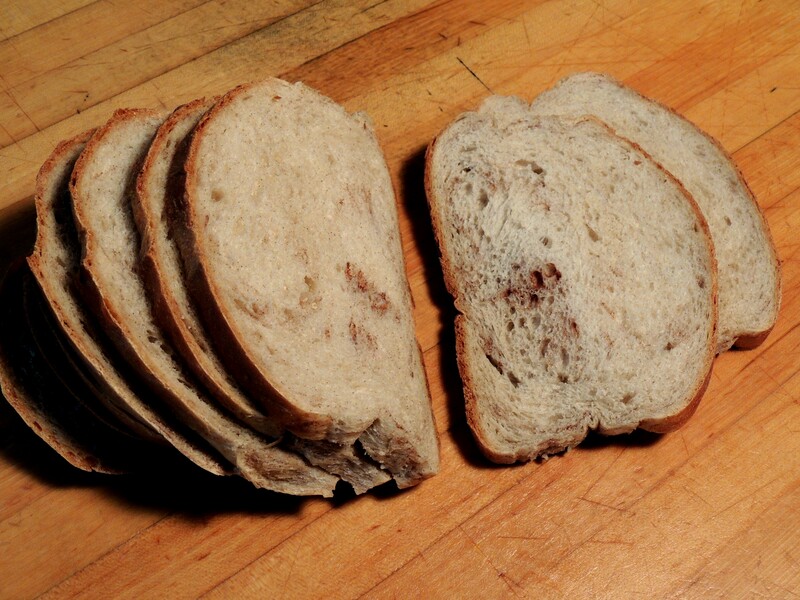 This is our popular signature whole wheat bread. 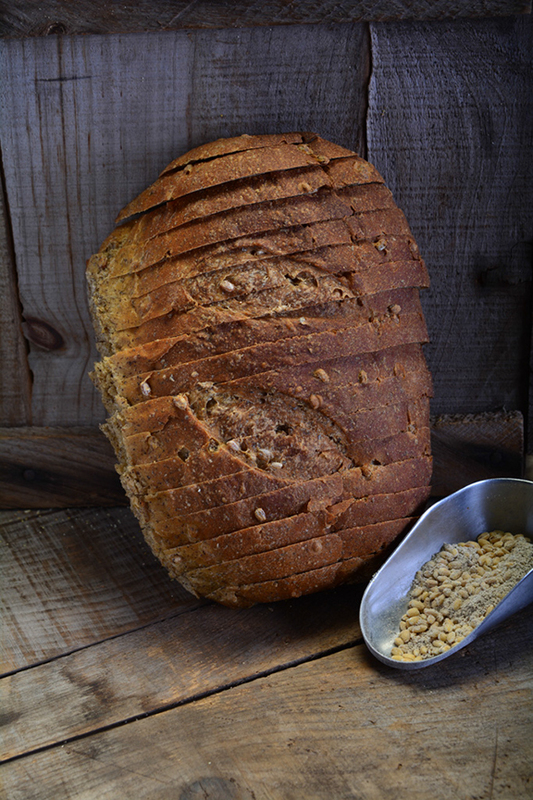 We make it with unbleached wheat flour, stone ground whole wheat flour, cracked wheat berries, molasses and honey. 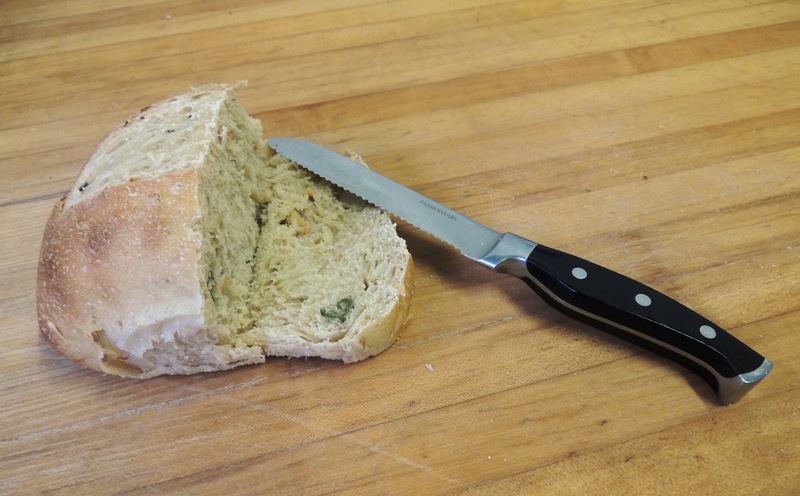 It’s a favorite for sandwiches, toast or dinner bread. Ingredients: Unbleached wheat flour, stone ground whole wheat flour, spring water, organic cracked wheat, wildflower honey, canola oil, molasses, yeast, salt. Some of our equipment such as the French-made mixer pictured above are specifically designed to work with pure natural dough’s. This mixer provides a gentle kneading action similar to hand kneading. Most of our products are available to wholesale customers. We would be happy to talk to you about how our natural products can work for your customers. 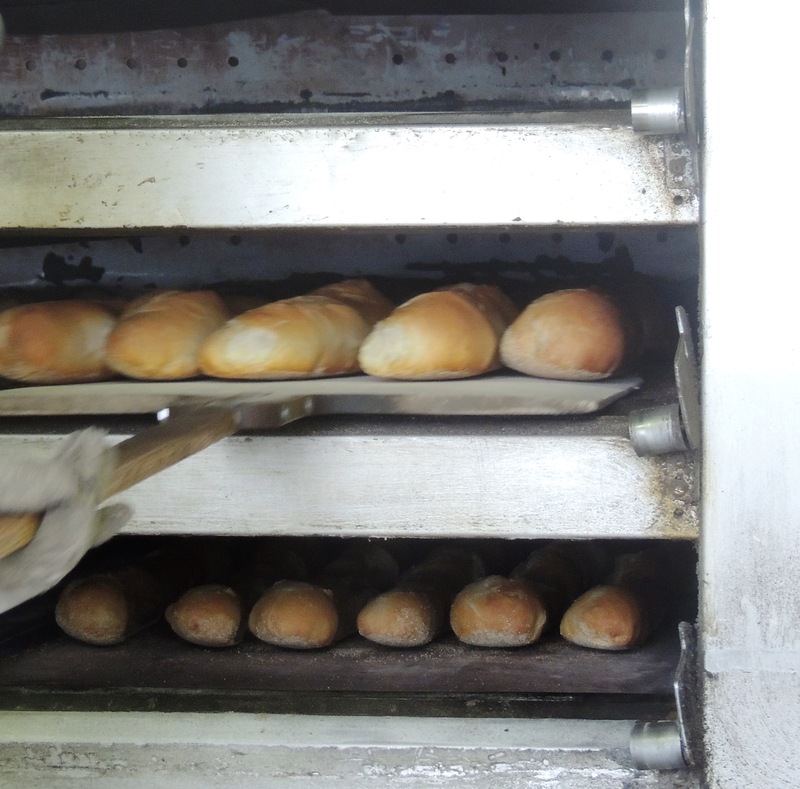 We bake most of our breads and other baked goods in our stone deck ovens imported from France. The heat in these ovens comes from the stone deck itself which helps the breads and other baked goods to naturally develop their hearth style shape and texture. French bread just out of the oven. How to keep our baked goods fresh! 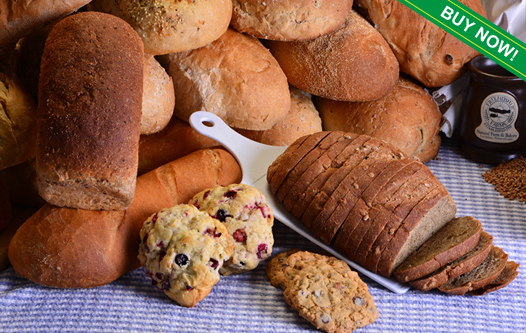 Keeping our natural baked goods fresh is easy! Divide them into portion sizes that you normally would use. Place the entire package in a Ziploc style bag and freeze. When you are ready to enjoy the item, simply pull out the desired portions. Reheating can be done quickly in a microwave, but for better results, let the product thaw and place it in a preheated oven or toaster oven (350 degrees) until it has reached the desired warmth and crustiness. Wrapping the baked good in foil will help prevent it from burning before its center has heated completely. Heating or toasting before serving will restore that delicious "just out of the oven" taste.